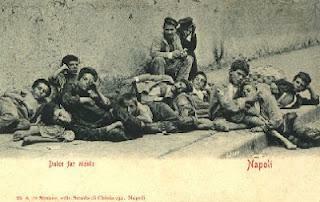 ﻿﻿ I can blame Naples – my home for ten years – for a lot of things. For a broken heart. For my agoraphobia. For my food snobbery. For my tendency to overgesticulate. And for my lack of confidence regarding proper Italian word endings. Let me explain. The spoken Neapolitan dialect tends to lop off the final vowel in most words. Well, it doesn’t exactly vanish but rather it melts – like buffalo mozzarella – into something like a schwa, that unclassifiable and typically English “uh” sound that makes its native speakers sound so very elegant. You’d think that Neapolitans, historically famous for their dolce far niente lifestyle and high unemployment, would have plenty of time to finish off a word, especially in the Italian language where the endings are so crucial to getting the message right. But that’s not how languages – or people – work. If you’re a learner of Italian, like I was at the age of sixteen, this widespread grammatical fuzziness can be quite handy. It’s also handy for uneducated locals who have grown up with the Neapolitan dialect as their first language. Until, that is, they’re forced to speak proper Italian. Once I saw an Italian news interview with a Neapolitan woman who had witnessed a building collapse in her ghetto. The strain of trying to get all those proper Italian endings right was painfully entertaining. She didn’t sound all that different from a drunk exchange student from Germany.